This is a recipe I wanted to try and nail down because the universe requires a chewy kind of candy without the maltitol. I also wanted to use unsweetened coconut for something absolutely fabulous. It only looks like you have to swoon across three fainting couches to make something this luxurious. What’s more, you can still swoon across the parlor divan with one of these bon bons in your hand for dramatic effect points as you serve them to guests to make them think you worked all day to make them. And for only 1.5 net carbs each, you deserve a little dramatic action. The inside is nutty, coconutty goodness, the way some candies should be. More importantly, there’s plenty of healthy fat to be had in these, which make them decadent and filling (gourmet foods are fatty and filling), so you can enjoy one of these lovely delights and feel like you’ve been to visit the Queen, without having to comb your hair first (I call that a win). In this recipe you have a healthy dessert which takes the edge off of those chocolate, chewy, crunchy cravings, but without breaking the carb bank. And because these employ healthy, gluten free, sugar free ingredients, you can pretty much wow anyone with these tiny desserts. There’s no guilt to be had here. Be gone, guilt! Bye, guilt. What? You left your purse? Too bad! OK. Well here. Take it. Now go. … Seriously? OK…. third door on the left. Then be gone! Mascarpone is a deliciously rich cheese (think cream cheese without all the gums). You can still use cream cheese in the recipe, but do try the marscarpone. I used Truvia (Stevia + Erythritol) at 0 net carbs to sweeten my recipe, but I’ve placed the close approximations in there so you can choose your own sweetener. I have made this recipe with just stevia before, and while it was decent, it wasn’t quite what I was hoping for. I really think in desserty type things (even healthy ones), you almost need a secondary sweetener in there to take off the edge. You can taste both the mix and the coating for taste, since neither require baking. I made the coating from chocolate to give you the most control over your coating. I think you’re really going to like it. You can sub in another nut for the pecans and walnuts, but I found almonds weren’t quite the flavor profile I was going for (I used almonds in the first batch). You could, however, sub out walnuts for almonds. I have revamped the chocolate coating recipe (hootie hoo) and I like it quite a lot. 1. Combine filling ingredients in mixing bowl. 2. Form into walnut-sized balls (about 2″). 3. Chill in refrigerator for an hour on waxed paper. 4. To make the coating, melt butter in microwave with cream, about 30 seconds, stirring at 15 or 20 seconds (you don’t want to fry the cream and butter, but merely melt them). 5. Stir in cocoa and sweetener, working in all ingredients. 6. Roll cold mini cakes in chocolate, coating thoroughly (I use a spoon). 7. Chill on waxed paper until ready to serve. Makes about 10 at about 1.5 net carbs each! I am soooooo excited to try these tonight! I live in a small rural town and it is very hard to find some of the ingredients in most dessert recipes. I will probably have to use cream cheese, but either way, this is going to be mine tonight! Thank you for this amazing blog. You have no idea how much you have helped me and boyfriend. We are down a combined 130 pounds since April and we owe a lot of it to you and your AMAZING recipes. Thank you so much! Oh, yeah, that's what I'm talkin' about! I can't wait to try these, Jamie. Thanks for the recipe, and for all you do to help us be low carb/high fat. These shall be mine soon! They look fantastic and I am looking forward to trying out the chocolate coating on other stuff! Oh my! I am headed to the grocery sore for some marscapone cheese so I can make these this afternoon. I, too, offer you many thanks, Jamie. It's recipes like yours that make being able to stick with low-carb so much easier. Whenever I begin to feel that I'm in a rut where my menus are concerned I always browse your blog for ideas. I am never disappointed! Lindsay– Wow!! I am so proud of you guys! If every you don't mkind being featured, I'd love to share your success story. You guys are phenomenal! Erica– I am so glad to oblige. I love low carb/high fat. It keeps me happy. Happy wife, happy life. Margo– Thank you so much! I am totally going on a cocoacoatingpalooza, too! Let me know what you coat in chocogreatness. Angela– Thank you so much for your kind words! It makes me so pleased to hear you say that. Sometimes I get into a rut, and that's when I get into trouble with crazy ingredients (although these aren't too crazy)… At least I didn't add cauliflower. Hi, if I leave out the coconut, do you think they would still work? I use coconut oil and coconut flour, but have never liked coconut flakes. Hi, Cindy! If you don't like coconut flakes, you could use nuts instead (or less marscapone). I never used to like dessicated coconut either. (making oogy face). You make me fall in low carb love with you all over again with this recipe! Aw shucks now. You almost made me schmootz my tea. Just one question, what does "3 Tbsp cup" (in "3 Tbsp cup sugar equivalent") mean? D'oh! The correction has been made. Thank you so much for catching that. It should be Tbsp, not cup. I have everything on hand but the mascarpone cheese, and I'll be dropping by the store soon to get it to make these. They look awesome, and so simple! Thank you! OMG!!! I am just coming off my P2, moving into P3 and this will be made next week for sure..yummmyyyyyy. Thank you ever so much for having the best low carb, sugar free recipes! Eva, thank you so much for your support…and congrats to moving onto P3! I can't wait to make these! As a matter of fact, I want to make these instead of dinner tonight, but I think the family deserves a little more than that. LOL I linked to the recipe from my blog, hope you don't mind. 🙂 I'm so excited I want all my bloggity friends to see what I'm making this weekend! I am so intrigued and would love to try these. I have been jones-ing for something just like this. However, I am going to ask the question: what can I use instead of tree-nuts? Any suggestions are welcome..
Hmm… That is a good question! You could try sunflower or pumpkin seeds since we're into the fall season now. Or, if adding seeds isn't amenable, you could halve the marscarpone and go with coconut, or double the coconut and leave the marscapone for a double coconutty treat. Saw this recipe on facebook posted by someone else, looked at it and said, "Didn't Jamie email me this recipe?" Then I read your comment- Glad I'm just a LITTLE crazy. Have a good one! I'm thankful it's a small enough community that we all know what's what! Often it's a little booboo. I know the owner of the page, and I know she had no idea the recipe wasn't the poster's. Donna's good people. Thank you for looking out for this. 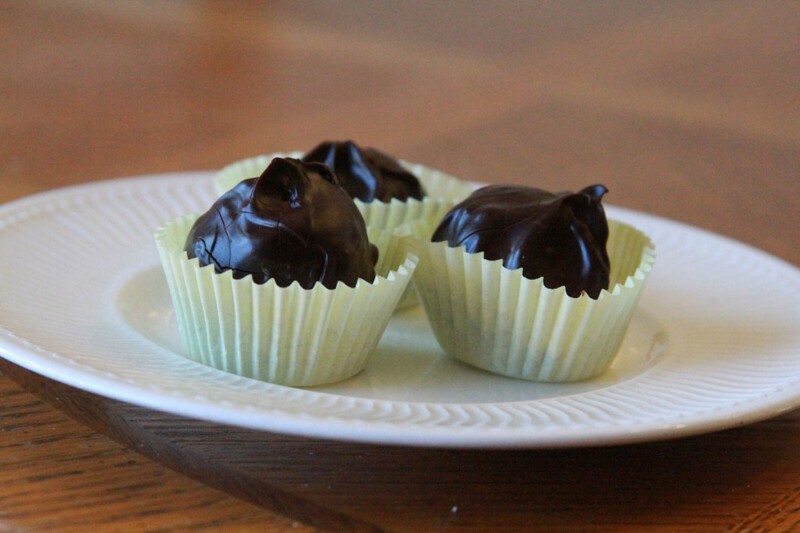 Jamie – this is the best low carb candy that I have ever made. Everyone loves it! No one knows that it is low carb, they just want more! I'm so glad, Nancy! Thank you for your feedback. You rock in the kitchen! Yum yum! Love your recipes. I will make these with unsalted butter next time, and there will be a next time, and a time after that too! health properties, plus the extra coconutty goodness. Hey! Could you? Theoretically yes, if you keep them refrigerated. I haven't tried it, though! It'd be worth a shot. Let me know if you try it! Well Jamie I finally experimented! I chilled and drained a can of coconut milk and used the solid part as the replacement for cream. Really, really good. I have been using this method as a replacement for cream in my coffee, also really good. Lately, cream has been causing a little “gastric distress”!! Try it – I think you will like it. Thank you for filling me in, Nancy! I know a ton of people will appreciate your help, too. I know we have some lactose intolerance in my family as well… *sigh*… and I’m a Wisconsin girl, too. Is Truvia a mixture of both Stevia + Erythrito or just a name brand of sweetener? This is all kind of new to me so if you can help out this would be great. Truvia is a sweetener that mixes erythritol an stevia together. You could use a different sweetener however. Truvia is more potent, so you only ad .75 tsp for 1 Tbsp normal sweetener. Knowing that my husband’s sweet tooth will find happiness ever after because of your help makes me really wanna send you a postcard each Christmas! – Just one little qiestion: Do you think I can sub the sugar/and its substitutes with Maple Syrup or would the batter turn too liquidy? Thank you and Happy Easter to you, too! According to this site, http://allrecipes.com/howto/baking-with-sugar-and-sugar-substitutes/ Although maple syrup is only 60% as sweet as sugar, use ¾ cup for every cup of white sugar and decrease the amount of liquid by 3 tablespoons to compensate for its liquid state. I just saw these and they look wonderful!!! I love desserts like this when you want something sweet where you have some portion control. Yes! And they are so rich that portion control shouldn’t be an issue, even though they’re small. They’re almost like mini cheesecakes–only even more rich. Firstly: AWESOME recipe, you rock and/or roll! Secondly: can I ask how much you usually pay for mascarpone? Mine was $17 which I thought was a little much, but its not a cheese that I’m used to buying so I’m not sure. I think it was worth it. I just made these yesterday, exactly as written, although I doubled the recipe. WOW!!! If I could rate them on a scale of 1-10, I’d give them an 11 !!!!! Crazy good! Thank you so much for this wonderful delight!!! First of all, these are amazing! I saw that you have several chocolate coating recipes and I was wondering if they just evolved over time or if different ones are tailored for each recipe? Could this chocolate coating be used for the donuts or the macaroons, for example? Thanks! Hi there! The coating recipe has evolved with time. I always tweak everything. It’s all an ongoing process! Made these with tweaks. I used 1/3 C of coconut butter instead of the flakes, used chopped macadamias and added 1T of dark Hawaiian rum. Also used those amounts in 8oz. of mascarpone since that’s the size container it comes in. Left the coating as is, but I put these in a bar pan and spread the coating on top. Just didn’t have the time to roll balls and coat them. I could see how this recipe could be changed up with different nuts and flavorings, maybe lemon or almond. Great recipe. Thanks! I made these today and they are the best!! I however used almond meal in place of walnuts/pecans, because that’s what I had.